Letter Candy Workshop - Uppercase Alphabet Freebie! 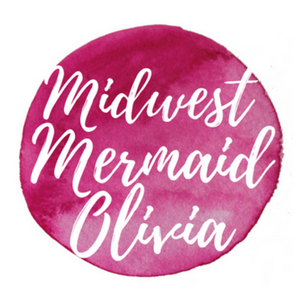 If you haven't heard via social media, I'm lucky enough to be able to teach a watercolor hand lettering workshop at The ARTgarage in Green Bay (today)! My workshop, called Letter Candy, is part of Art Night Out week. The ARTgarage has been hosting different workshops all week taught by Wisconsin artists ranging from many different topics. Art Night Out takes place during one week of the month with a different class offered each evening. Each two-hour class is $35 per person with materials, fees, and complimentary wine included for those 21 and up. I've been asked to teach another class next month, but the topic will be watercolor flowers! Click here to be one of the first to sign up! Anyways, if you have taken Letter Candy and have been directed here for further resources, I just want to thank you! Thanks for signing up and showing up and wanting to invest in yourself. 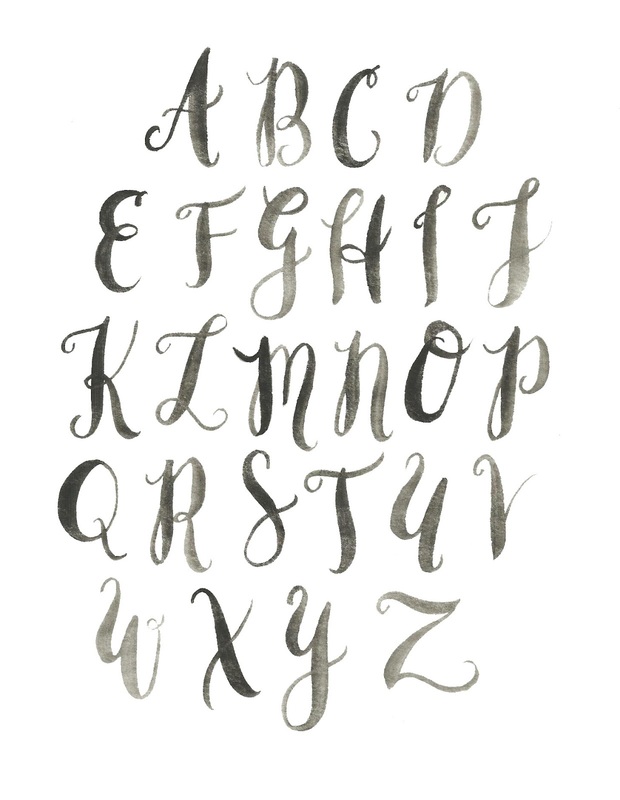 As promised, here is my uppercase alphabet! 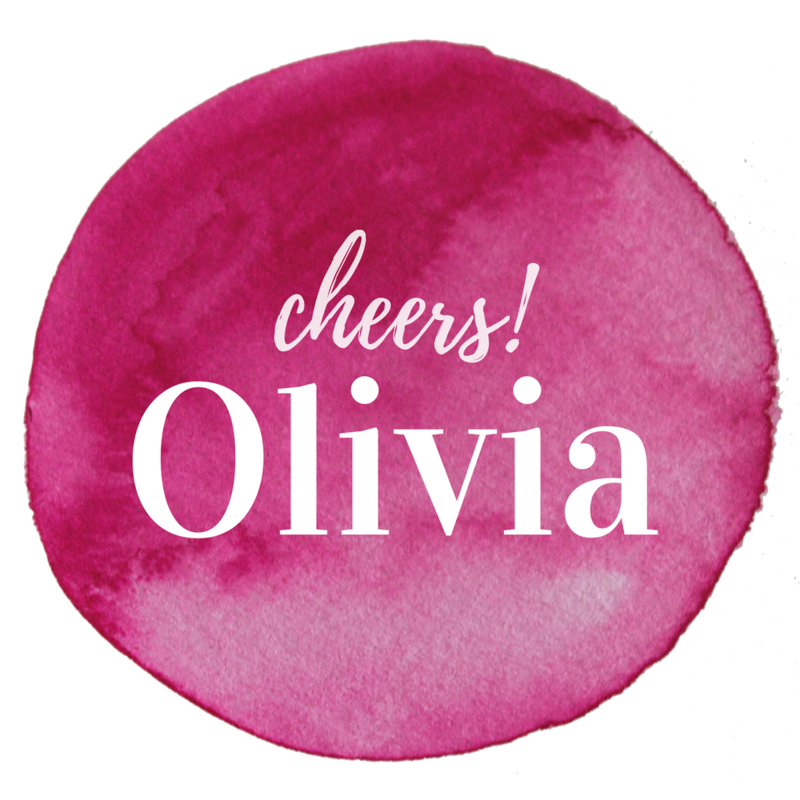 If you just ended up here because you read my blog, enjoy this freebie! And if you're interested in learning more and having access to my lowercase alphabet, let me know. Maybe we can put together another hand lettering workshop! Please email me at ojmedrow@gmail.com if you were one of my *pupils* (hahaha) and would like me to send you the file of this uppercase alphabet image! That's pretty much it to get you started at home. Again, thanks for your interest in learning this skill from me! 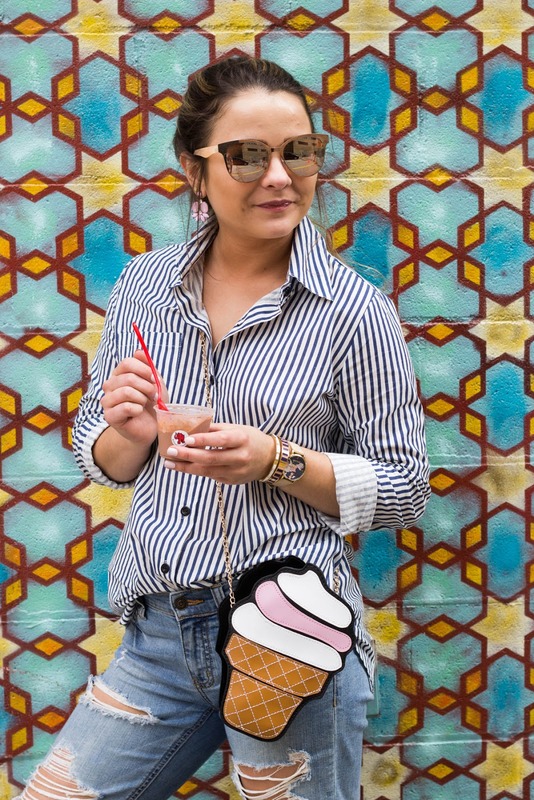 OOTD: Happy National Ice Cream Day! With an outfit, of course! 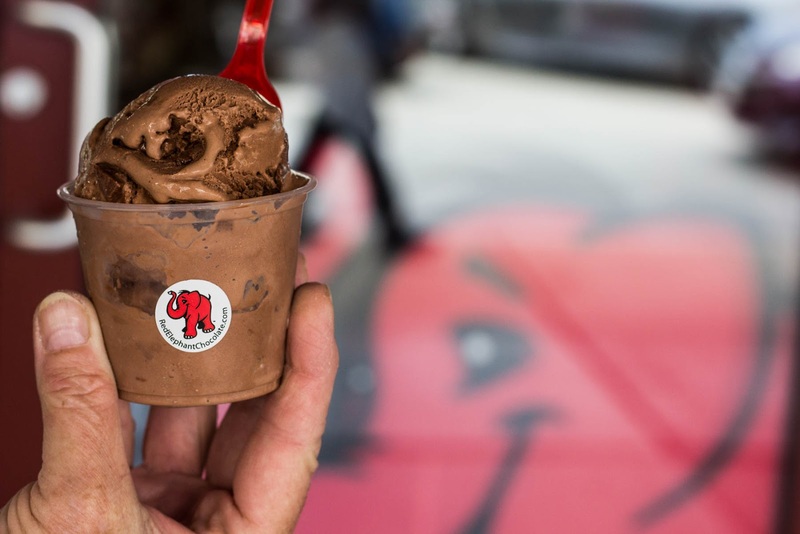 And some ice cream from Red Elephant Chocolate in the Third Ward. So a little back story about my choice of ice cream... 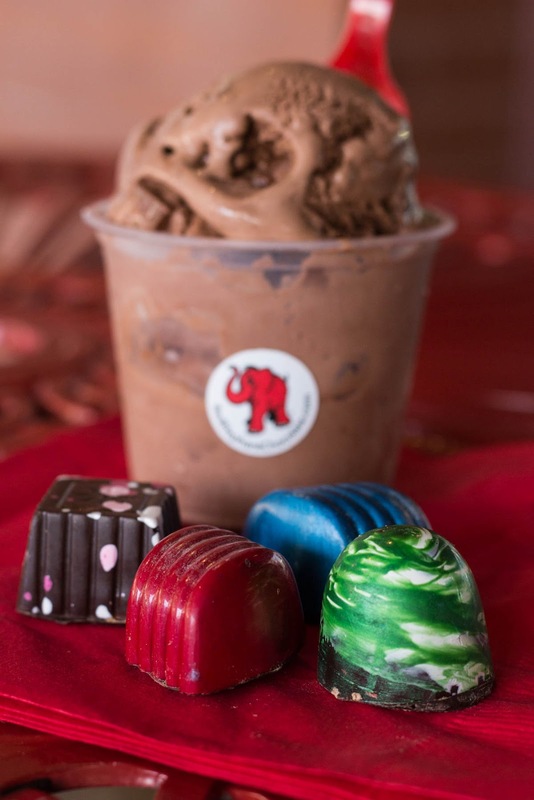 I used to work at Red Elephant Chocolate during the summer while I was home from college. I knew it would be the perfect place to grab some ice cream to celebrate this holiday! I got cow tracks, which was chocolate ice cream with peanut butter and chocolate (what tasted like Reese's) mixed in. Really, anything you choose at Red Elephant is delicious. I always have to get a few truffles, so pictured below are: caramelized banana, bourbon old fashioned, chai, and salted caramel whiskey (that's my all-time fave)! As for the outfit, it all kind of fell together right before my eyes! I had recently purchased these Gray Malin for Sperry sneakers. They feature one of his AMAZING images of South Beach in Miami. Since I can't afford any of his art, nor do I have the wall space at the moment, I just haaaad to grab a pair of his shoes when he launched the collection! Go have a look at his photography because it's serious eye candy. I love how he has been printing on nontraditional surfaces too! Not only does he have a line with Sperry, he has beach towels, Swell bottles, phone cases, serving trays, cocktail kits, and more. Next on my list of must-have items is his coffee table book! 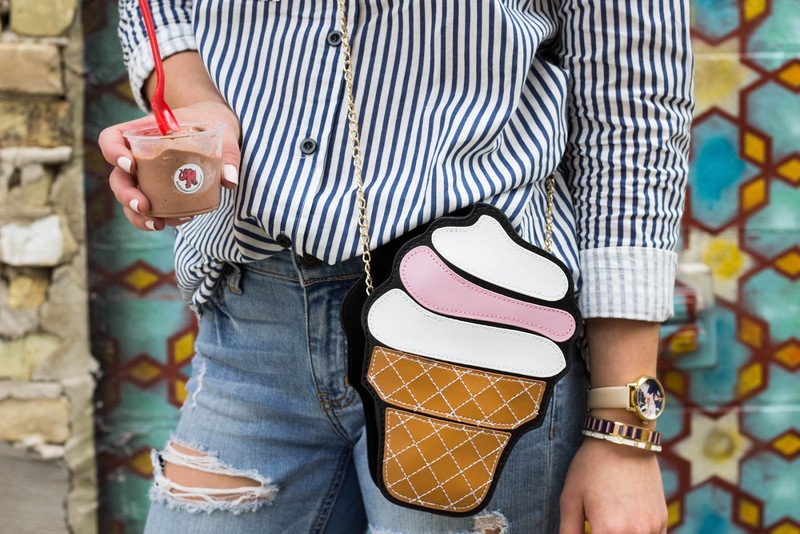 For National Ice Cream Day, I knew I had to throw on this ice cream shaped novelty bag I recently purchased. It's super inexpensive at $12.99 and Prime shipping, which is awesome. I got compliments on it everywhere I went! Also very reasonably priced with Prime shipping, I'm wearing this striped button down. I love how casual this top is and I'm excited to wear it later on this year in Florida with shorts and a floppy hat. I think it will be perfect to create a super cute beachy look. Every time I wear these jeans, I get questions about them! I knew when I bought them that they would be keepers. Unfortunately they are a couple years old, so they are no longer available. But I linked something similar! For accessories, I wore my favorite kate spade Going Places watch that has the map of Europe on the face. I always pair my watches with a couple bangles, so I threw on a couple from kate. These are the white set in stone bangle and a striped idiom bangle from last summer. 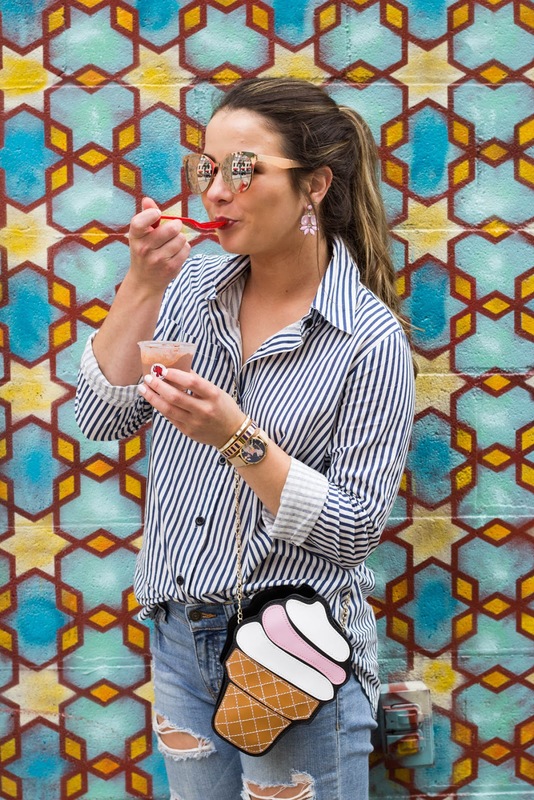 My earrings and sunglasses are old from Charming Charlie, but I linked similar items! PS: I'm getting these great shots with my newest lens that I'm v excited about. It's the Canon 50mm f/1.8 and I am in looooove. I hope you're celebrating National Ice Cream Day in the best way possible - with your favorite flavor! 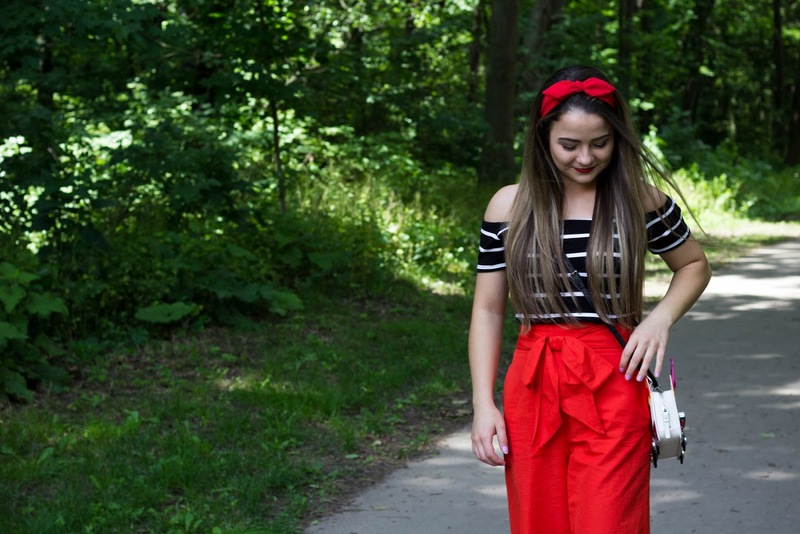 An OOTD miniblog! 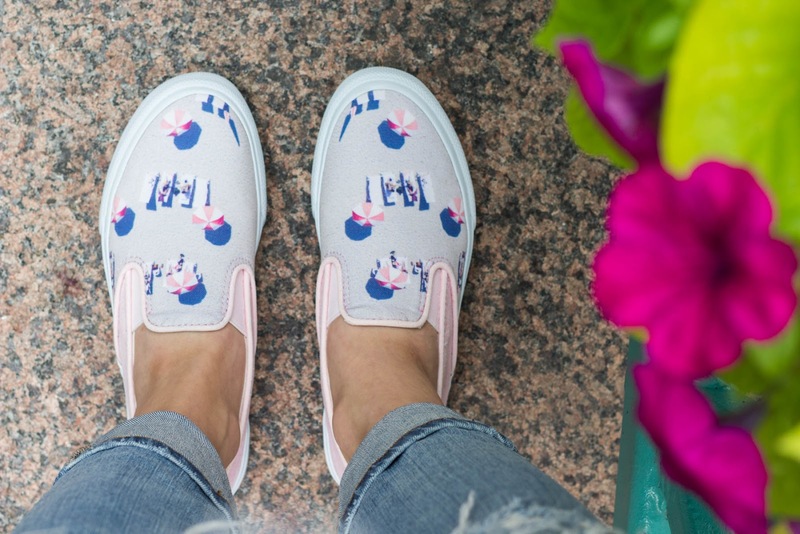 kate spade Summer Faves Part 3.5! Say hello to the taco recipe that is currently on repeat at my house! These spicy shrimp tacos with garlic cilantro lime slaw are from Pinch of Yum and are the best recipe I've found online in quite a while! Although, I do have an affinity for tacos, so they automatically rank high on my list of favorite foods. It's a simple and quick weeknight meal. The shrimp are very very mildly spicy, so I think they're a good option for pleasing a group. The slaw is the best part - It's fresh and flavorful, not to mention tangy and crunchy. Sprinkle some Cotija cheese, drizzle a lime, and throw on some avocado and you're golden! 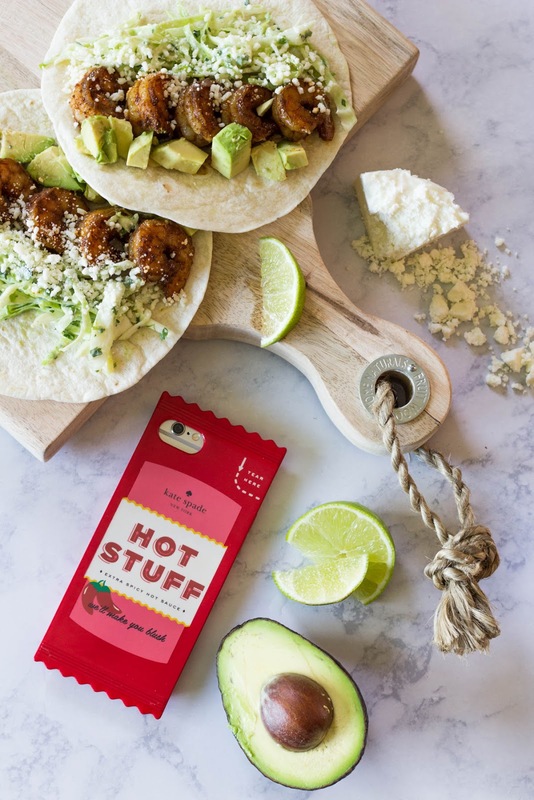 And then what better to pair your favorite taco recipe with some hot sauce? For your phone, that is. If you know me, you already know I love a whimsical case! This one is kate spade and is made for the iPhone 7. I actually have an iPhone 6, but they fit in 7 cases. It doesn't work the other way around. 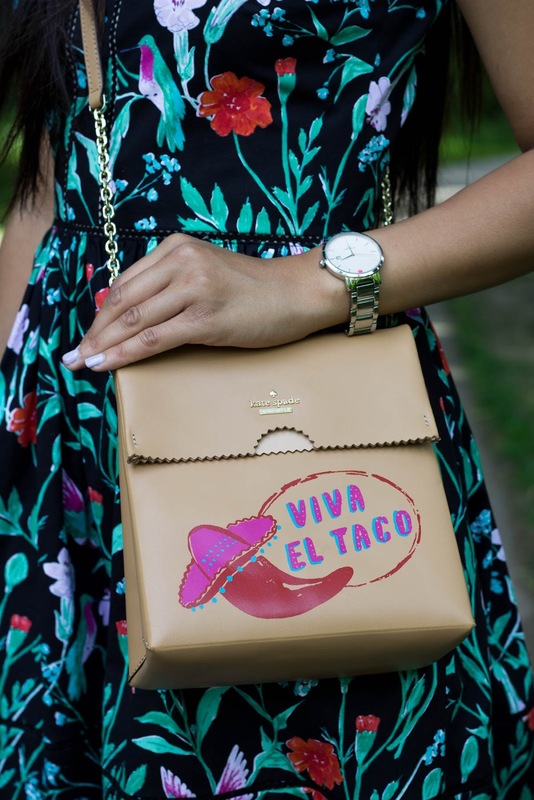 OOTD: kate spade Mexico Summer Faves Part Three! 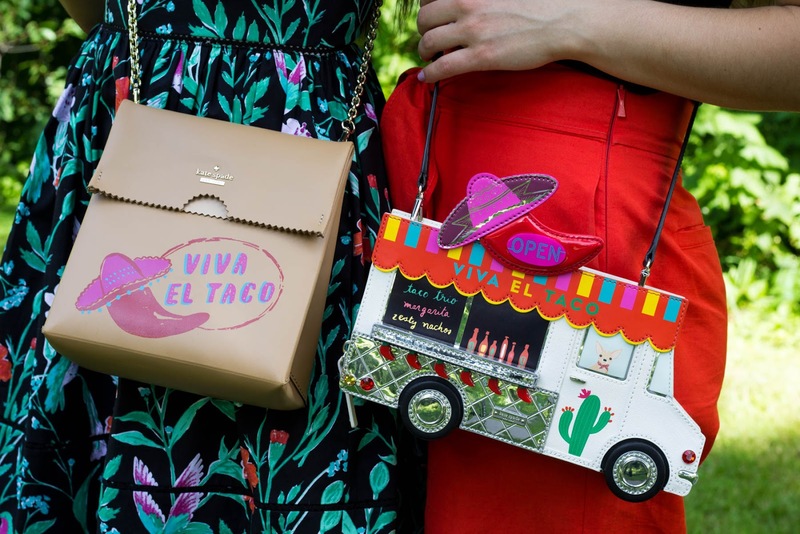 Hiiiiiii, I'm back again with more Mexico faves from the kate spade summer collection! -She and I have each of these outfits. So we could actually do a separate post in completely opposite attire! We did buy different novelty bags though. And I'll have you know, they are quite the conversation starters. Without further ado, I present to you the "jardin" print dress and red culottes! 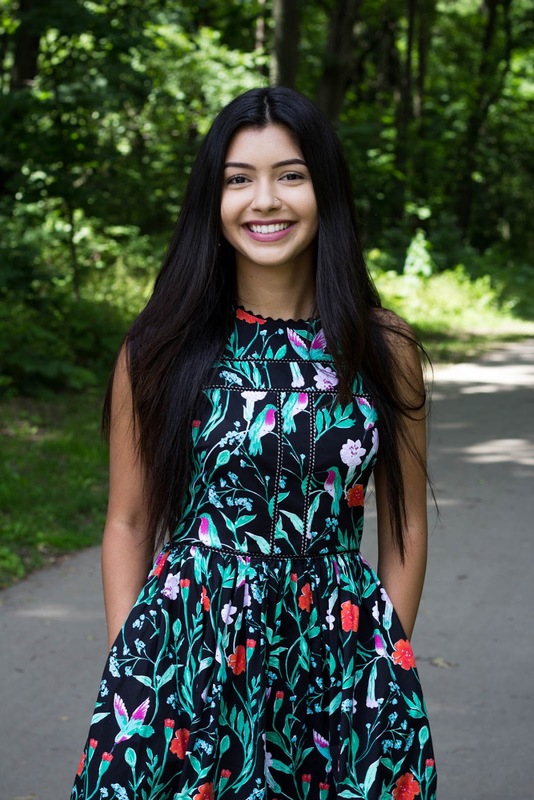 I can't say enough about how much I love the jardin print dress that Janai is wearing. Like I said above, we both have this dress. As do many of our coworkers. I would say that the most popular event to wear it to is a wedding! Janai already has done so, and I know multiple other people who plan to do the same throughout the summer. 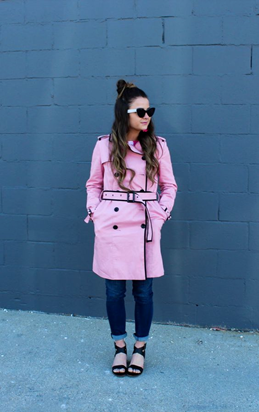 It is a fit that looks flattering on EVERYONE! It's cotton, so it's super comfy too. It's a great dress to have because you can dress it up or down with your choice of accessories. 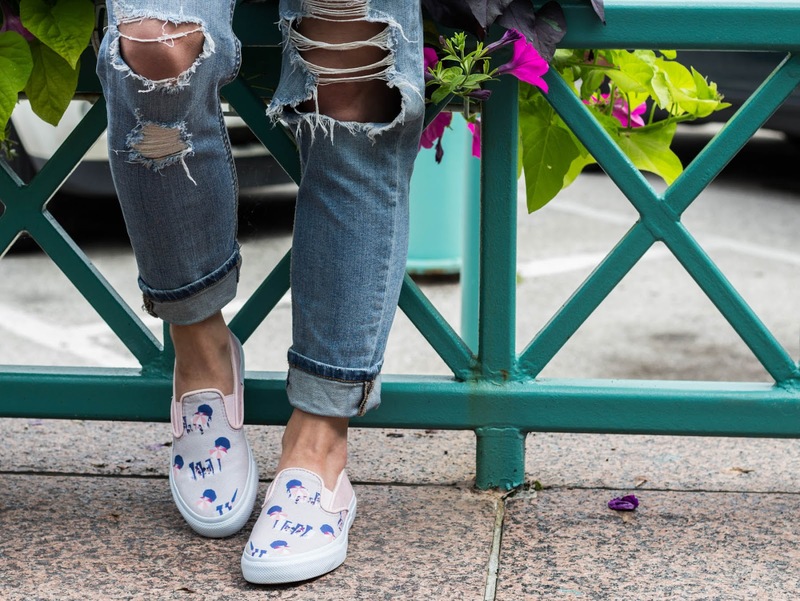 And the jardin print itself (which is represented through the entire summer collection very consistently) is something you will not find anywhere else. Look at the detail of the hummingbirds and flowers! *The jardin dress seems to be almost sold out online. I would check your closest specialty store if you are interested in this dress because I'm sure they would be able to find one in your size! 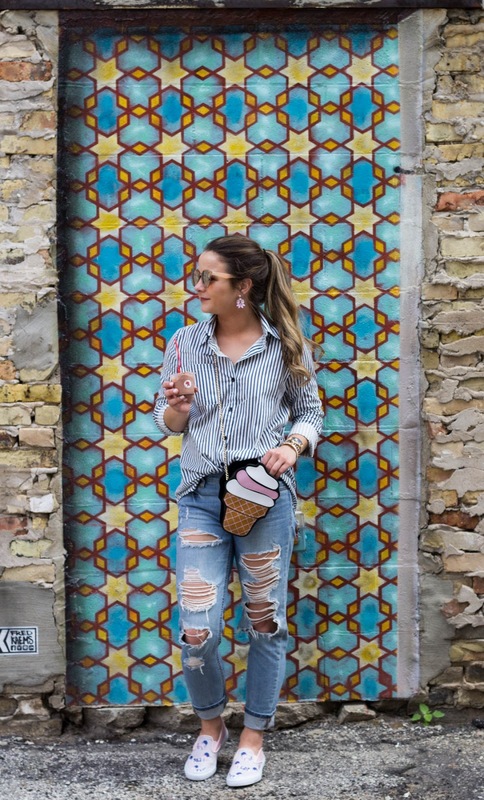 The cotton culottes are a must-have. I was nervous at first because I'm so petite that they would be too overpowering and long for me to wear. They actually fit me very well! I have never been one to wear this style of pant, but when I was at the kate store in New York they were alllll about the culottes. I kind of adjusted my opinion on them! I really like how they look. Then slap a bow on anything and I'm sold. The top that I'm wearing was something I picked up for like $14 at Forever 21 last summer. I wear it with so many different outfits! 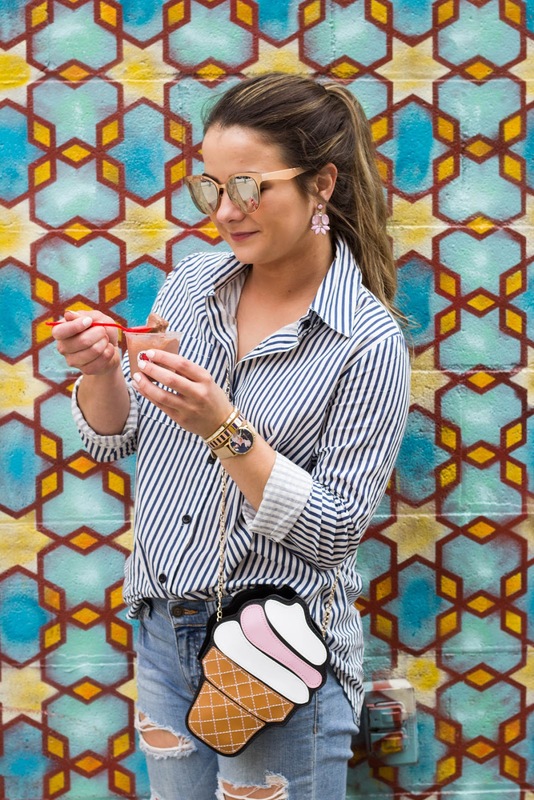 It's great to have that go-to striped top that looks cute with everything. We were both wearing kate earrings for these looks. I had on the taco/hot sauce studs. 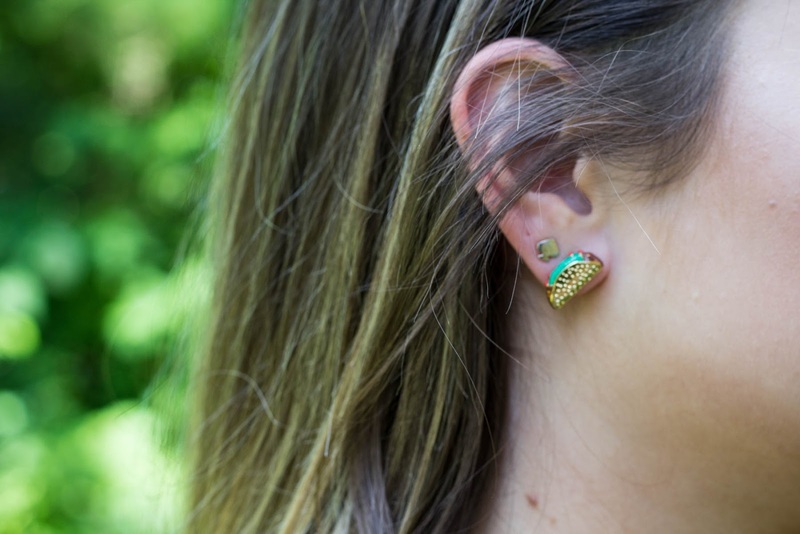 I have a special place in my heart for earrings that are two different shapes. 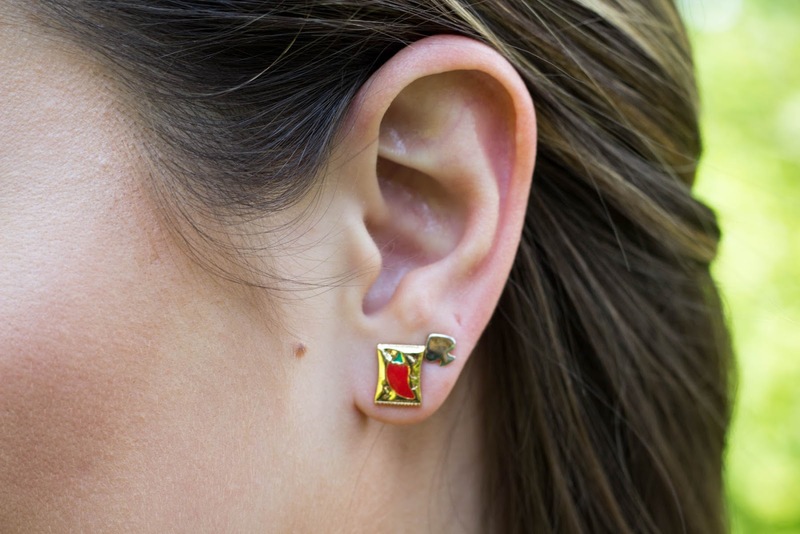 I have the teacup and teapot ones from last spring and I think they're the perfect quirky little touch to an outfit! When I saw that I could have a taco on one ear and a hot sauce packet on the other, I knew they would be mine. I also wore this headband from Forever 21. It's inexpensive (and actually on sale right now) and also matches the pants perfectly! 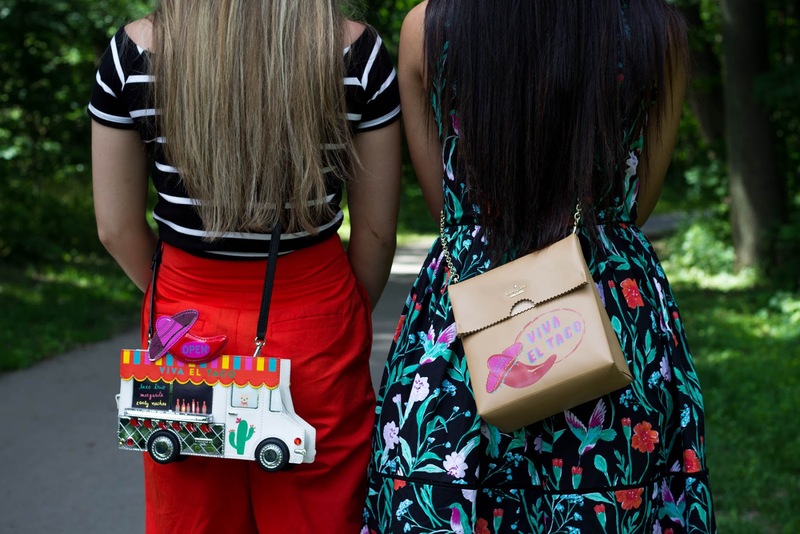 The taco truck bag is my favorite novelty bag ever! And something I talked about in this post. Janai bought the takeout bag, which is equally as cute! There is also a hot sauce packet crossbody, which I like too. It was definitely artistic genius on the part of the designers to decide on this trio! I wore my favorite summer sandals from Target. Janai wore the most beautiful pair of kate heels, called Pax. Take a good look at them! The heels are completely covered with Aurora Borealis stones. They're one of the prettiest styles of kate shoes I have ever seen! And good news...they're on sale! Pick these up before they sell out! The Pax heels are the perfect way to dress up the jardin dress. To dress it down, I have worn it with the Carlita sandals. I have them in gold. That's all I've got for this week's installment of summer faves! 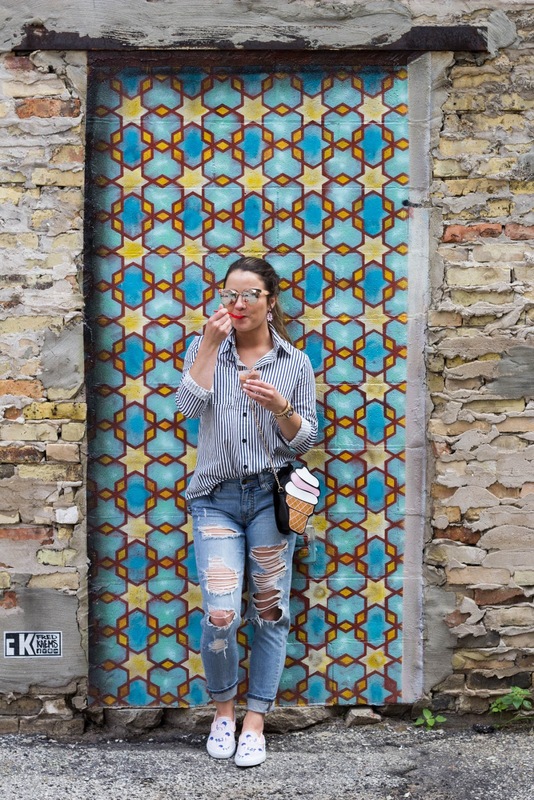 If you missed the last two looks of Mexico, check them out here!